Making lemon sorbet is like making lemonade with a detour through the ice cream maker. Easy! We pulled down several Meyer lemons last week to avoid the freeze that hit here in California and I’ve been thinking up things to do with them. As a major lemonade fan, lemon sorbet was a logical choice. Lemon sorbet is pretty intense — sweet and acidic. I can see why it is often used as a palate cleanser between meal courses. It is best eaten in small amounts. An added benefit of having some around in the freezer is that if you happen to be in the mood for lemonade, you can take a few scoops and mix it in with some water, and voilà, instant lemonade. 1 Make simple syrup, let cool:In a small saucepan on medium high heat, make a simple syrup by heating sugar, lemon zest, and water until the sugar has completely dissolved. Remove from heat, let cool, strain out the lemon zest. 2 Add lemon juice, then chill: Mix in the lemon juice. Chill, either in the refrigerator, or by placing in a metal bowl over an ice bath. 3 Process in your ice cream maker: Once the mixture has thoroughly chilled, freeze in your ice cream maker according to the manufacturer's instructions. If you don't have an ice cream maker, you can pour the mixture into a shallow pan and freeze in your freezer until semi-solid. Then take a fork and fluff it up, returning it the the freezer to freeze firm. Then put in a food-processor or blender to process until smooth. Place sorbet in an airtight container and freeze until ready to serve. 4 Serve: Scoop out preferably with a melon-baller. Garnish with mint. Hello! All photos and content are copyright protected. Please do not use our photos without prior written permission. If you wish to republish this recipe, please rewrite the recipe in your own unique words and link back to Meyer Lemon Sorbet on Simply Recipes. Thank you! I made this for our Valentine feast and it AMAZING!! I only added 3/4 cup of sugar, based on previous comments about the sweetness. Next time I’m going to try a 1/2 cup! My husband loved it, but he has a super “sweet tooth” and I’d like to see if more of the fresh lemon flavor comes through with a bit less sugar. I used our Cuisinart ice cream maker and the consistency was perfect! I did have to freeze it for 4-5 hours, so plan ahead. Overall it was quite easy with delicious results. It’s a keeper! Hi Cortney, I’m so glad you like it! I use the one from SNO since it has an actual compressor unlike the CuisineArt ones which are just a stirrer that depends on the coldness of the bowl to freeze any contents and does no cooling itself. The one from Sno come with a this cylinder shaped container and is cooled by the machine itself just like with the expensive machines. You can also get extra container it prepare one batch while the first one is freezing. I can get my batches to the hard stage and not just the soft stage of limited models like those from CuisineArt that are just transferring heat from the mixture to the bowl and stirring. I alos do not have to have bowls in the freezer but just place in in the refrigerator while preparing a batch to cool it and start up the machine and go since the machine will continue to cool it further unlike those other machines which depend 100% upon the bowl and can not remove any heat. It can be 80 degrees in the house and I can still make nearly (needs to be just soft enough to transfer) solid sorbets and ice creams and not mushy ones. I’m probably going to add some basil to the simple syrup and then strain it. It works well from Lemonade so it should work for lemon sorbets as well just use much less water. 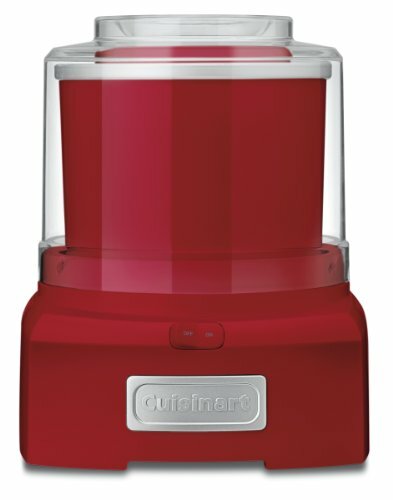 Cuisinart makes an ice cream freezer with it’s own compressor. It is a bit pricy but worth the $$$. The only caveat is that it should not be moved around. It needs a permanent home. If you do need to move it, it will need 24 hours to settle before using it. Chef Jeff, Cuisinart actually makes an ice cream maker with build in compressor. We have one and have successfully used it for many years. No need to freeze bowls ahead of time. My name is Michelle and I am 12 years old and I live in Australia. My mum Kerry and I tried this recipe and it turned out fantastic. Please keep on coming up with great recipes like this. Thanks for the simple recipe. Can’t wait to make other sorbets with this method! As always, when googling for a quality simple recipe such as this, Simple Recipes came up at the top. I was so excited to see Meyer Lemons at my local Whole Foods (in Indiana) and so I grabbed three and came home to see what I could do. I have to say I’m slightly obsessed with their floral perfumy scent and taste. I made sorbet to try to get a real feel for their flavor and I’m in love with this recipe. I’ll probably go back to find more and attempt a lemon tart. Thanks again for a quality recipe. Last season I used organic Meyer lemons that I purchased online from Katz and Company in Napa California (www.katzandco.com), and it was amazing. The Meyer lemons arrived in various stages of ripeness, and so I was able to make the sorbet a number of times as the lemons ripened. I understand that this is going to be a banner year for the Meyer Lemon crop in California. I’ve experimented with a similar recipe for Meyer Lemon Sorbet. I added some home-made limoncello and the sorbet stays soft no matter how hard my frost-free freezer tries to turn it into a brick. The first batch I made was too sour, but I upped the water and boiled the lemon zest for just a minute and the results were fantastic. I just made this sorbet today, with Meyer lemons from a friend’s CA friend backyard tree (they don’t grow in Montana and I have never seen them commercially). While I have made regular lemon sorbet before, this recipe is very easy and the results are truly incredible. Now I wish I had more lemons! I’m in germany, I’ve never heard of meyer lemons, so I used “regular” lemons. I don’t even know if meyer lemons are available here at all. I only had 2 so I substituted orange juice for the rest of the cup of juice. I’d say a bit more than 1/3 of a cup, so it might have been nearly half and half. I also cooked the zest in the syrup in the hope of it getting more flavour and also of the zest getting softer. Next time I will probably strain it out as it’s kind of bitter and chewy. I don’t have an ice cream maker so I froze it as per your alternative directions and wow it’s good! My 6 y.o. son even liked it (we had to try every time we stirred, you see) and he doesn’t like sour things at all. I also like to strain my sorbet to remove the zest, but I have also found that adding a little mint to the syrup about half way through the simmer adds a great flavor to the finshed sorbet. Quite refreshing and a great snack! Oh, what great ideas! I think I’ll try simmering the zest in the simple syrup next time and straining, thanks Shuna. (For those readers unfamiliar with the work of Shuna Fish Lydon, Shuna is a professional pastry chef extraordinaire. I bow to her expertise, as well as that of David Lebovitz, whenever graced with their suggestions and advice.) Speaking of which, regarding David’s question, we are using the handy dandy Cuisinart ice cream maker – easy to use and inexpensive too. Amazon usually has a pretty good deal on it. By the way, I just got back from the Fancy Food Show in San Francisco and had the most amazing pomegranate rose water sorbet. The texture was so fine, I couldn’t believe there wasn’t some type of binder in it -egg, milk, something. But no. The reason is, as explained by the purveyor, is that commercial class machines cut up the ice crystals at a finer gauge than what we can do with our home ice cream makers. Regarding Meyer lemons, apparently they are not typically grown commercially because the are susceptible to disease that they easily spread to each other. So they don’t do orchard life well. They are however, well suited to backyards, especially here in California. And they can deal with frost, and even survive temps in the high 20s (we covered our trees with blankets and burlap during the freeze last week). They are sweeter than typical lemons, with thinner skins. The skins are less tart as well. They are marvelous in salad dressings, we use them all year round. What kind of ice cream maker do you use? You’re certainly having a grand time with it! Your sorbet reminds me of my own concoction. I adapted a recipe from the now defunct Velvet Turtle restaurant chain here in Southern California. Called Lemon Velvet, it was a favorite on their menu. I’ve changed it some, and I use Meyer lemon juice since I have a prolific tree. I package up the juice and some zest in freezer packages during the Meyer-lemon-off-season so we can have this any time of year. This has the most piquant taste; it’s also very easy to make since everything is already at chilled temperature, so it can be mixed and put immediately into the ice cream freezer. Combine the zest and juice in a blender to puree until the zest is in very small pices. Combine remaining ingredients, stir to combine well, then freeze according to ice cream maker’s instructions. Scoop into a container and freeze for a couple of hours before serving. Note: the original recipe called for 2 c half and half, 1 12-oz can evaporated milk and 1 1/2 c whole milk. I also reduced the amount of zest, though it depends on the size of your lemons. I use Trader Joe’s fat-free half and half – it seems to give a nice softness to the ice cream (makes it easier to scoop out once it’s frozen solid too). Put a scoop or two in a glass, add some tequila or vodka to taste (or whatever suits your needs), and enjoy. One helpful addition I’ve picked up from Alton Brown is the addition of a little bit of vodka to sorbets and ices. If you add maybe a tablespoon worth before you put it in the churn, the sorbet will remain much more scoopable, and I’ve never noticed any alcoholic flavor from that small an amount. It may not be a factor with this particular one, as the acid may do the same thing. I have found it to be perfect for watermelon or cucumber sorbets. I made a lemon sorbet last year with buttermilk. Yes – buttermilk. Had a great tang and creamy texture, but still more sorbet than ice cream. Meyer lemons are so foreign to us on the east coast, and I’ve passed on a lot of recipes calling for them as they’re supposed to be somewhat unique from your everyday grocery store lemons. Any suggestions on reputable mail-order sources out there on the “left” coast? You will get more flavour out of that zest if you add it to the simple syrup and simmer it for about 10-20 minutes. Me persoanlly I don’t like the bits of zest to get in the way of the smooth melting sensation of the pure sorbet flavour, so I pass the scented syrup through a fine meshed sieve and then I add the syrup to taste because sometimes the lemons are very sweet to begin with. I love the photo! So pretty at that bird’s eye view!